Sweater Weather! These cozy lightweight pullover sweaters are made from velvety soft Cirrus™ Fleece and the 4-way stretch fabric provides the ultimate in comfort for those hard to fit weenie shapes. There's no bothersome closures or pesky sleeves to trip up short weenie legs, simply pull it on and your doxie will be snugly warm and comfortable all day or night. Sweaters fit comfortably under harnesses and heavier coats. Available in 21 colors and 4 sizes. Made in USA. 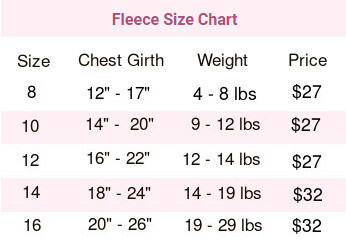 The sweaters are sized by the girth measurement and your doxie's weight. Don't worry about the length. If the girth and weight are right the length will balance out. If you have any sizing questions, we're here to help! 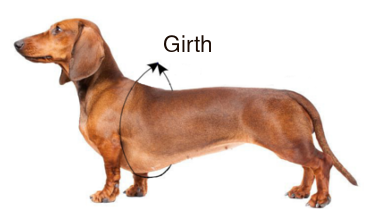 Girth: With your dachshund standing on all fours measure the widest part of the chest directly behind the front legs. If your doxie has a deep chest the sweater may be slightly shorter along the back as it stretches to accommodate the girth. FIT GUIDE: Using the chart below find where your dachshund's measurements fall. If your doxie is in between sizes select by choosing the closest weight. SIZING TIP: This fleece is exceptionally stretchy! If your dachshund is on the smaller side of the girth measurement we recommend sizing down. For example, Oscar modeling the Eggplant sweater in the above photos, has an 18" girth and weighs 14.5 lbs. He is wearing a size 12. * Wear Tip: The center chest seam is designed to be on the outside so only soft comfy fleece is next to your doxie's chest. Care Instructions: Machine wash, tumble dry. Avoid fabric softener as over time softener can cause pilling. No hassle returns and exchanges! We all know dachshunds are notoriously hard to fit but you can order with confidence as we ship exchanges for free and cheerfully accept returns. Returns in new, unworn and unwashed condition will receive a full refund of the purchase price (less shipping). Returns that have been worn or washed will receive a store credit and the item will be donated to rescue. Fits our Doxie well. At first it looked like a cape instead of a sweater. I like that it is light weight and soft for my dog. It is so hard to find sweaters that fully cover our doxie’s long skinny body. She usually looks like she’s wearing a halter. This jacket fits perfect, and it is so soft, warm, and lightweight. Thank you! I must have bought half a dozen sweaters that didn’t fit- this one is perfect! Just bought a second one. They are soft and well made. Our dachshund loves them. We love them! They are so soft and the length is perfect for my mini dachshunds! After buying multiple sweaters that didn’t work, we have a winner! Love this, fits our dachshund perfectly, and could not be more pleased. Ordering another. Runs a little large. Wish I had ordered a smaller size. Great fabric, washes great. Very well made , beautiful plaid color. Crissy loves it. Never likes anything on but it’s so soft she wants to keep it on. I will have to buy another one. We ordered this for our 12 pound dachshund mix. We were initially surprised and disappointed that the fleece was so thin. Once we put it on our Sophie we appreciated the weight and stretch of the fabric. Sophie loves it and growls when we take it off. I see another color in our future! This sweater is absolutely wonderful! I had tried many sweater in the past and none of them ever fit my dachshund properly - they would always be too big and fall off of her. This sweater fits my doxie perfectly. It is the perfect size and fit. It never falls off of her. Plus it's soft, warm and cozy. Also, the customer service is wonderful. I wasn't sure exactly which size to order so I contacted customer service. The representative was very knowledgeable and friendly. She chose the correct size for my doxie. I received the sweater in about four days. It's just perfect!